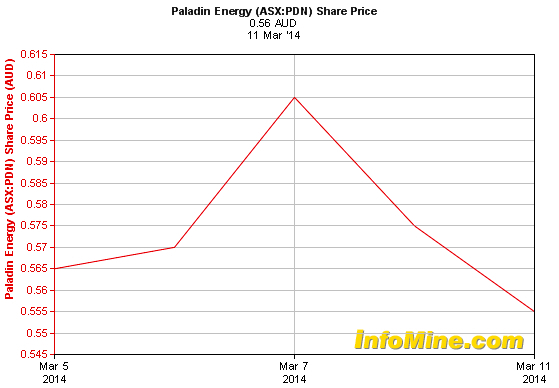 Shares in Paladin Energy Limited (ASX, TSX:PDN) fell over 5% in Australia after news broke one of the world's largest gold producers Newmont Mining Corporation (NYSE:NEM) is selling its 5.4% stake in the uranium miner. Newmont, which acquired an interest in the uranium after buying Fronteer Gold in 2011, said the sale will generate more than $24 million in cash for the company and is inline with its strategy to divest non-core assets. At the time of acquisition the stake was valued at about $278 million, but Paladin’s share price was struck shortly after by the Fukushima nuclear disaster and has had a rocky time since then.